One best friend and three comrades, lost. Three limbs, gone. One marriage, ended. Over 130 surgeries, endured. Keys was inspired to climb Mount Kilimanjaro by the five men in his unit who were killed in the explosion. 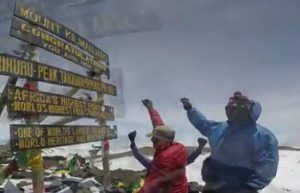 The Purple Heart recipient, on two prosthetic legs, left his medal at the summit of Kilimanjaro, the highest mountain in Africa, as a nod to servicemembers around the world. The climb took him six days, and he trained for six months to prepare for it. Sgt. Keys plans to run in the New York City Marathon on November 4th, and he is an inspiration to all.